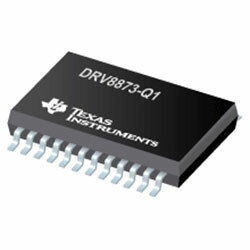 The Texas Instruments DRV8873-Q1 device is an integrated driver IC for driving a brushed DC motor in automotive applications. Two logic inputs command the H-bridge driver, which comprises four N-channel MOSFETs that drive motors bi-directionally with up to 10A peak current. The device runs from a single power supply and supports a broad input supply range from 4.5V to 38V. A PH/EN or PWM interface enables simple interfacing to controller circuits. An alternative is the independent half-bridge control which is available to drive two solenoid loads. A current mirror enables the controller to monitor the load current. This mirror approximates the current through the high-side FETs and does not need a high-power resistor for sensing the current. A low-power sleep mode is offered to obtain very-low quiescent current draw by shutting down much of the internal circuitry. Internal protection functions are used for undervoltage lockout, charge pump faults, short-circuit protection, overcurrent protection, open-load detection, and overtemperature. Fault conditions are indicated on an nFAULT pin and through the SPI registers.